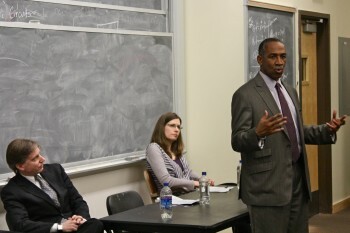 Tyrone Werts (front) was the featured speaker on a panel that included criminal defense attorney Paul J. Hetznecker and Barb Toews, a restorative justice educator. Haverford House fellow Emily Bock '11, with support from the CPGC, organized a discussion of the criminal justice system. Among the panelists: Tyrone Werts, whose life sentence for murder was commuted after he spent 36 years in prison. A standing-room only audience gathered in a lecture room in Hilles Hall on Wednesday night for a panel discussion organized by Haverford House fellow Emily Bock '11. The event, titled“Life After Life: Reflections on Justice,” was sponsored by the Center for Peace and Global Citizenship (CPGC) and featured Tyrone Werts, who spent much of his adult life in prison on a murder charge. Werts' road out of prison was a long one, enduring two delays in his commutation appeal while his case was“taken under advisement” first once, then a second time. But during the 36 years Werts spent at Graterford, he earned a bachelor's degree from Villanova University (two of his Villanova professors were in attendance on Wednesday night), worked as a tutor to help others earn their GEDs, became heavily involved with Temple University's nationally renowned Inside-Out Prison Exchange Program, and established the Lifers' Public Safety Initiative (PSI) with other incarcerated men. Pennsylvania's“life means life” policy, which mandates a life without parole sentence for defendants convicted of first and second degree murder, was one of the evening's most heavily discussed topics. Paul J. Hetznecker, a Philadelphia-based civil rights and criminal defense attorney, stressed the importance of the defense attorney as the last line of defense for the constitution, particularly when juries are denied the information that a second degree murder guilty verdict carries a guaranteed life sentence. A program of the CPGC, Haverford House is an urban post-graduate program for community living and service in Philadelphia, and helps to strengthens Haverford College's campus connections with the city.